I'm a sucker for 40mm launchers in any form, and it's been a good long while since I've had my hands on a true M203 style unit. DBoys has had their 3-in-1 launcher out for a while now, but I hadn't seen a lot of information out about it, so I decided the time was right for a formal review of it. This launcher isn't perfect, but it's a great starting place, and I will discuss all of the various aspects of it in this review! I obtained this launcher through Airsplat, who has it available HERE, currently priced at $89.99. For my buildup that you'll see later on in the review, I also needed the CA low profile front mount, available HERE, priced at $19.99. After UPS thoroughly screwed up shipping a simple package from California to Utah (through no fault of Airsplat), I received the launcher with no apparent damage. Airsplat was very helpful in tracking down the lost package, so they handled a crappy situation by UPS very well! 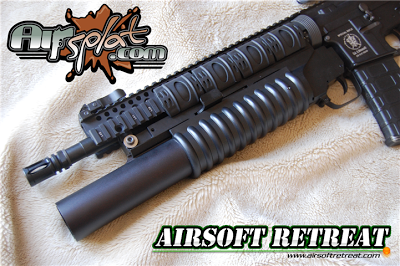 In airsoft, an M203, or any 40mm launcher really, basically serves as a stylish device to hold an M203 shell and facilitate it's launching using a basic trigger activated push-button system. Yes, you can generally fire a 40mm shell by holding it and pushing the button on the back, but an M203 looks more realistic and makes operation much easier. The DBoys 3-in-1 M203 is so named due to its inclusion of three separate mounting systems; 20mm RIS, TM style barrel/delta ring, and G&P/real steel type delta ring. This gives you the ability to mount this thing on pretty much any gun you want, with only minor alterations needed in some cases. DBoys has everything packaged up in a sturdy cardboard box with a sticker indicating which M203 is inside. DBoys has both short and long versions available, and the one I am reviewing today is the long version. Along with the full metal launcher, DBoys includes the aforementioned various rear mounts, as well as a large QD front mount. For my specific buildup, I ditched the front mount for the much smaller CA mount, which was necessary for mounting under the RIS on my gun. The DBoys M203 can be considered a full metal replica, as everything that is metal on a real M203 is metal on this replica. 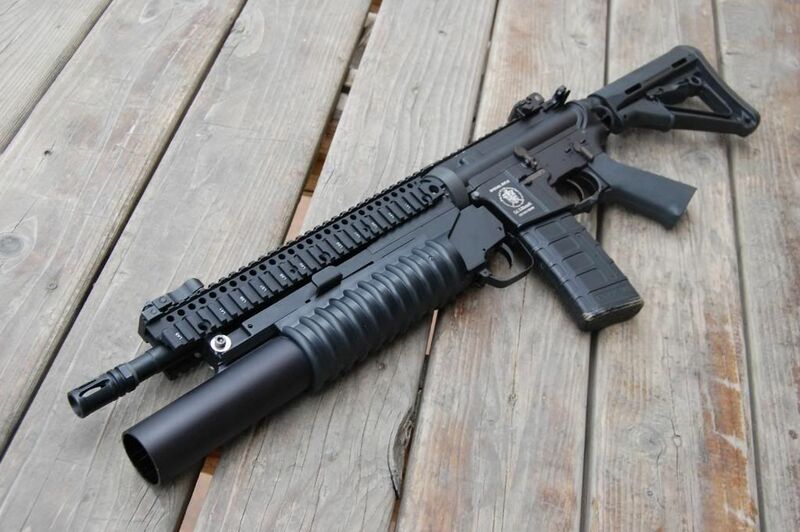 The only polymer part is the ribbed handguard, with everything else being made of various alloys. The frame of the launcher is made of a non-ferrous metal, probably "pot metal", and houses the fire controls and mounting hardware, as well as providing the track for the sliding barrel assembly. It is well cast, however, the paint finish is a little bit rough in some places. The trigger is a very basic unit that activates a simple push rod that fires the shell. It has a safety at the front of the trigger guard to prevent accidental firing, and the trigger guard itself is flexible to allow mounting to different guns. Towards the front of the frame on the left side, you will find the large push button/lever that releases the barrel lock and allows the assembly to slide forward for reloading. On mine, this would not lock back securely, and I had to dremel part of the barrel locking mechanism just slightly to allow it to lock. This is a problem that I've heard of others having, so it's something to look out for. The barrel/handguard assembly can be removed entirely by pushing on the small locking lever located on the top of the frame at the very front. This is how I accessed the locking ledge to dremel it down slightly. The barrel itself is made of metal and has mock rifling grooves, however, it has no rotation in the grooves themselves. It's a nice cosmetic touch that makes it look a bit more realistic. The included mounts are quite strong, and can be swapped out by removing the two screws at the top of the frame holding them in. The front mount is a bit tricky to use, requiring you to pull out the safety wire, and push down on the silver button while sliding the pivoting lock up and out of the way. Like I said before, for my use, I swapped this out for the lower profile CA style mount. The frame is entirely devoid of any markings whatsoever, as DBoys wanted to avoid any trademark issues. Being an M203, this doesn't use magazines at all, instead holding and firing a single 40mm shell at a time. I tested it with CA, ICS, S-Thunder, and Madbull shells without issue, however, on my S-Thunder CO2 shells, the trigger pull was a little bit heavier than normal, due to the stiffer valve assembly. Like all 40mm launchers, this really doesn't have any performance to measure, as the power output depends entirely on the shell used, however, the long barrel does allow you to fire alternative projectiles, such as foam rounds by MilSim Labs. That is what makes the long launcher really shine, as it'll add a fair bit of range to their 40mm foam warhead versus a shorter launcher. Internally, these are incredibly simple, only using a single moving part, which is the trigger/push bar assembly. It seems to be fairly robust, however, I have heard of some users breaking theirs with extremly high pressure shells. Using my highest pressure CO2 shells, I haven't seen any issues yet, but it is something to keep an eye out for. In order to mount mine up how I wanted, I had to do some substantial modification to the G&P mount. I was mounting it on my APS M4, which has a 12" Madbull Omega rail installed. I could have gone the easy route and just RIS mounted it, but that's no fun. Instead, I opted to remove the lower rail section and barrel mount the M203. As the M4 used a real steel type delta ring, I was able to use the G&P mount, which slid in with no issues at all. Once I tried installing the top portion of the rail, I ran into problems, as it is VERY slim inside the rail with no room for the top portion of the rear mount. About 20 minutes with the dremel later, I was able to chop off the top of the mount to clear the inner structure of the Omega rail. At the front, the CA mount was a bit too long to fit onto the frame of the launcher, so I had to sand it down a bit (less than 1mm) to fit securely without bowing out. Once mounted up, and with washers put in place due to the long screws, It mounted up perfectly and very securely. I needed a specific M203 for my buildup, and the DBoys 3-in-1 launcher fit the bill perfectly. It is available at a great price, and with a bit of tweaking, it worked perfectly. It's a shame that mine didn't lock back out of the box, as that can really turn a new user off, however, it was a very easy fix. Now it is mounted securely on my custom M4 buildup, and adds a whole new look and level of firepower to an otherwise fairly mundane gun.